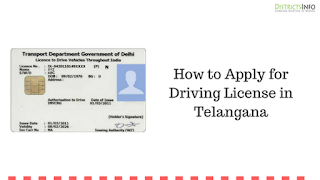 How to Apply for Driving License in Telangana, Driving License Online Apply in Telangana, Driving License Status in Telangana, Online Driving License in Telangana: Driving license is a very important document as it can be used as a proof of address. As we have seen that nowadays the number of road accidents are increasing day by day. This is because of many reasons. But one of them is rash driving. Today many people get driving license because of influence also. But the government is now trying their best to make some good changes for our people so that these things can decrease. 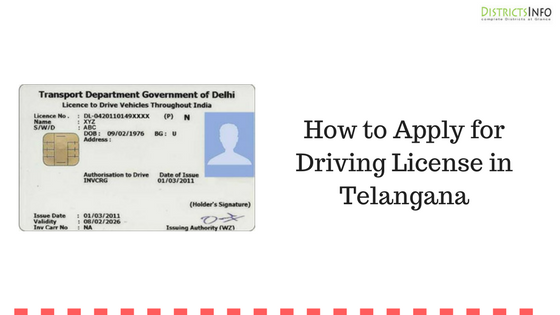 Here in our article, How to Apply for Driving License in Telangana we will tell you all about driving license in Telangana. As now you can easily apply for a driving license in Telangana. But first, you must have a learner's license. Driving license is now one of the important document in India. It can be used as photo proof by the people. But there are some peoples who don't have a driving license, but they are driving bikes and cars. As now this thing has become so easy for people. Now you can easily get a driving license. Also, this will help you in many places. Like we know now that traffic police are becoming very strict in these matters. if you get caught then you will be fined. And by mistake also if you met with an accident and you don't have a driving license then it will be a big problem. So here in our article, How to Apply for Driving License in Telangana we will notify you about everything. * Voter's identity card (EPIC Card). * Utility bills like electricity, telephone bill, gas bill. * State or Central Government issued payslip. * Driving school certificate (for transport vehicle driving license applicants). * All documents pertaining to the vehicle to be used for the driving test. * First of all you must have a learner's license. * If you have learner's license then click here. * Now you need to fill the forms. * Give your learner's license number, date of birth and other information. * Select test center and submit. * Then you need to choose a slot for you where you need to go to nearest RTO office. * Give the test and then it will be decided that you will get a driving license. * First of all you need to go to your nearest RTO office. * Now you will get a form named as form 4. * Fill this form carefully. * Also, provide the documents and attach it carefully. * Now you need to book a slot for driving license test. * Pay the amount and you will be provided with a slot. * Then go that day on provided time and slot for the test. * Go to the official website. * Choose renewal of license and click go. * Now fill the form and click ok.
* Now after 10-15 days you can go to RTO office to collect your driving license. * Also, you can download it online. This is all about driving license. So you must have a driving license as it is very important for your future.